& unity also marks the triumph of good over evil. it is the perfect time to renew sweet relationships. are an integral part of the festivities. - buy readymade rasgullas, remove from syrup n keep aside . Wow simply superb and perfect dear...What a beautiful clicks and presentation dear...really fantastic..
Hi Smita! First time here. You have a very lovely blog. Amazing job dear. Hereafter , if I need to do a party decor or something , the first thing I will do is to visit yours:) Keep rocking dear! 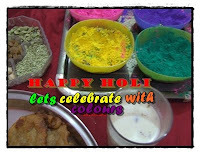 A very happy and colorful Holi to you and your family. As usual I am awestruck after noticing the beautiful snaps that you have taken for Holi. Really lovely way to celebrate. A very beautiful Indian Spring in colors! The Gujiya Cupcakes and rasogollas have that clean classic looks! Wowww so beautiful and colourful dishes.. Thanks for liking the creations n putting in such kind words . Luved the colorful rasgullas...full of creativity! Awww this is such a sweet post. I love those sumptuous recipe and those dishes. I so love them!